Defence Minister Christopher Pyne and Defence Industry Minister Linda Reynolds have announced that a series of Australian SMEs will increase their role in support of the Royal Australian Air Force’s F-35 Joint Strike Fighters and F/A-18F Super Hornets. Australia's defence SME sector is going from strength to strength following a series of announcements made by Minister Pyne and Minister Reynolds. Hunter-based Nupress Tools will help keep the Royal Australian Air Force's growing fifth-generation fleet of Joint Strike Fighter in the air after winning a contract to manufacture parts for the engine that powers the global F-35 fleet. Nupress Tools and F-35 Program prime contractor Pratt & Whitney have signed a seven-year, multimillion-dollar contract to produce precision machined small parts for the F135 engine. "Under this contract, Nupress expect to produce 50 per cent of the global supply of five engine components for Pratt & Whitney. This is a fantastic achievement and I congratulate Nupress’ management and staff for their dedication to the global F-35 Program and Australia’s national security," Minister Pyne said. Minister Reynolds said this additional work would create more jobs for Australians in the Hunter, building on the company’s current 50-strong workforce of structural and mechanical engineers, drafting, machinist, finance and administrative professionals. "The small machined parts Nupress will manufacture for the F135 engine include components such as brackets, clamps, tubes and adaptors," Minister Reynolds added. Minister Reynolds explained, "This is another example of our outstanding performance in the global Joint Strike Fighter Program, with Australian industry already having shared in more than $1.3 billion in global production contracts to date." Building on this achievement, ministers Pyne and Reynolds announced the approval of AIR 6000 Phase 3 to acquire a range of new weapons and countermeasures for both the F-35A Joint Strike Fighters and F/A-18F Super Hornets. Minister Pyne added, "Aircraft self-protection countermeasures and weapons are essential elements of Australia’s air combat capability. 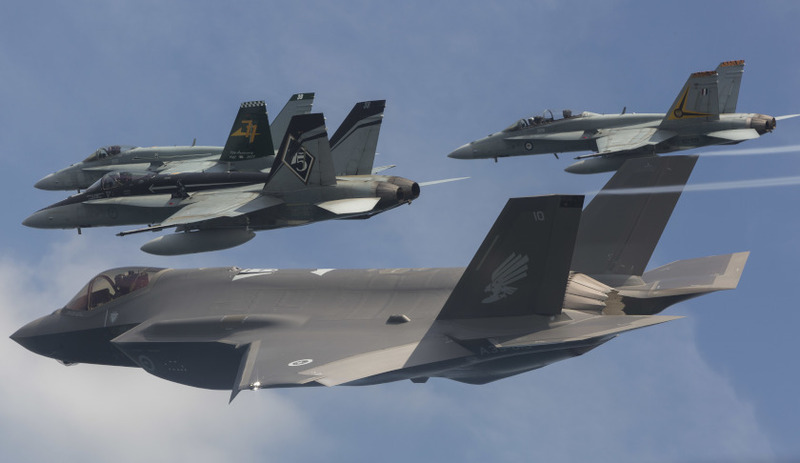 This latest investment will ensure weapons and decoys are available as Australia’s air combat fleet transitions to the F-35A and Super Hornet." Minister Reynolds said the Commonwealth government’s continued investment in the Joint Strike Fighter program provided greater opportunities for Australian companies to maximise their success in the defence industry. "Thales Australia will supply weapon components and Chemring Australia will supply countermeasures for the project. The Joint Strike Fighter program has so far delivered over 2,400 jobs, with this number expected to increase to over 5,000 jobs by 2023," Minister Reynolds explained.